"Genetic disorders have a significant impact on society. The vast majority of such disorders are serious, for the moment none are curable, and relatively few are amenable to satisfactory management. The Arab World, due to its geography as well as its social customs, has gained a very unique position in terms of its genetic background. For instance, the wide-spread custom of relative marriages has led not only to a preponderance of genetic disorders in the region, but also to the presence of many genetic defects seen nowhere else in the world. A very large proportion of the population is affected by serious genetic defects. Added to this, the general lack of public awareness makes for a very grave state of affairs. The Centre for Arab Genomic Studies came into being in 2003, under the aegis of the Sheikh Hamdan Bin Rashid Al Maktoum Award for Medical Sciences, with the intent to better understand the spectrum of genetic disorders afflicting the Arab population. 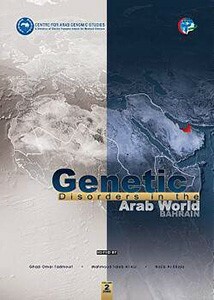 The First volume of the book “Genetic Disorders in the Arab World”, served to present the situation of genetic disorders, from the perspective of the United Arab Emirates. Since the publication of the book a couple of years ago, CAGS, with the help of its online ‘Catalogue for Transmission Genetics in Arabs’ (CTGA) database, has been able to reveal almost all the genetic disorders prevalent in the UAE. This, in itself, is a great step forward. However, CAGS has now started working on a new country, the Kingdom of Bahrain. This Second volume of the book, therefore, aims to provide an update on the situation of genetic disorders in the UAE, as well as an overview of genetic disorders and genetic research undertaken in Bahrain. Words would fail to express the gratitude of the Centre towards H.H. Sheikh Hamdan Bin Rashid Al Maktoum, for his constant encouragement and support, which has been instrumental in the great output of work that the Centre has produced in the past two years, and consequently in the release of this book. Thanks are also due to the Members of the Board of Trustees and the General Secretariat of the Sheikh Hamdan Award for Medical Sciences, Members of the Executive Board and the Arab Council of CAGS, as well as authors who contributed to this book, for their invaluable guidance and support. I hope that this book goes a long way, not only in spreading awareness of genetic disorders in the Arab World, but also in allying geneticists and medical professionals working on such disorders among the Arab population."